"After many years of experimentation, I've finally perfected what I think is the ideal formula for a rich pumpkin pie that's also much less likely to crack on top. Serve garnished with whipped cream and freshly grated nutmeg." Whisk together pumpkin puree, egg yolks, and egg in a large bowl until smooth. Add sweetened condensed milk, cinnamon, ginger, salt, nutmeg, and Chinese 5-spice powder; whisk until thoroughly combined. Fit pie crust in a 9-inch pie plate and crimp edges. Pour filling into the pie shell and lightly tap on the work surface to release any air bubbles. Reduce heat to 350 degrees F (175 degrees C) and bake until just set in the middle, 30 to 40 more minutes. A paring knife inserted into the filling, 1 inch from the crust, should come out clean. Allow to cool completely before serving. If desired, substitute 1 small pinch of ground star anise, ground cloves, and ground white pepper for five-spice powder. 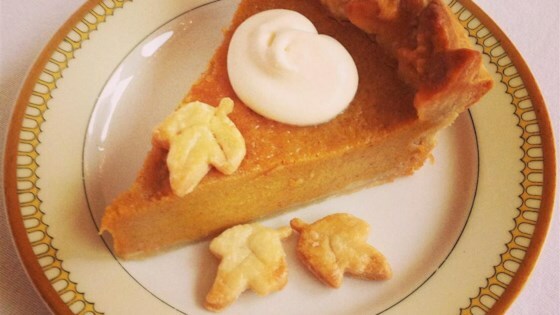 The PERFECT pumpkin pie. Delicately spiced, lightly sweetened with absolutely NO CRACKS. VERY good. NOTE: I did cover the pie halfway through with foil to keep the crust from burning. Thanks Chef John, I used your recipe but added 1/4 of the Chinese 5 spice instead of 1/8 and I took 2nd place in a pumpkin pie contest! Tried it but used 2 cups of fresh pumpkin puree from pie pumpkins instead of the canned stuff, very tasty and was a huge hit with the whole family.